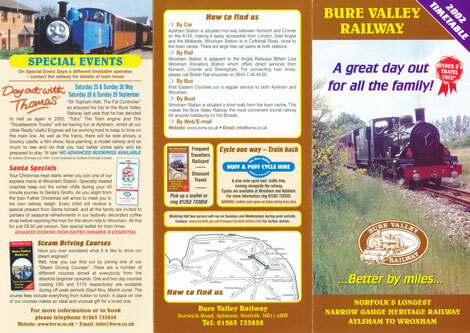 The Bure Valley Railway was opened on 10th July 1990 along the trackbed of the the East Norfolk Railway's branch from Wroxham to Aylsham (9 miles / 14.5 kilometres). There are intermediate halts at Brampton, Buxton and Coltishall. 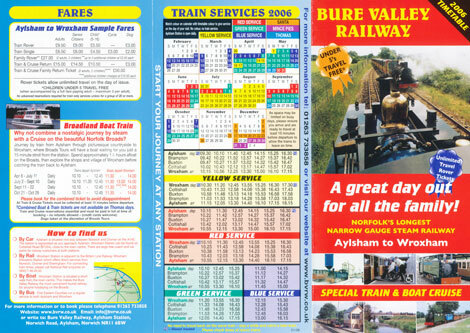 Engineering works include 17 bridges, one a 105 ft (32 m) long girder bridge over the River Bure in Buxton as well as Aylsham Bypass Tunnel under the A140 at Aylsham (the only operational runnel in Norfolk). The ENR started operations in 1877 when the East Norfolk Railway opened from Norwich to Cromer, with an extension from Wroxham to Aylsham in 1880. 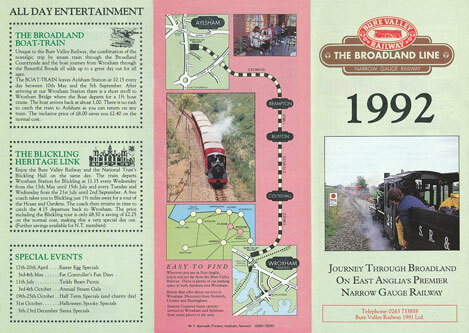 The ENR was taken over by the Great Eastern Railway in 1882, which was amalgamated into the London & North Eastern Railway in 1923. The railway was nationalised in 1948. In 1952 the passenger service stopped, but the freight service continued. 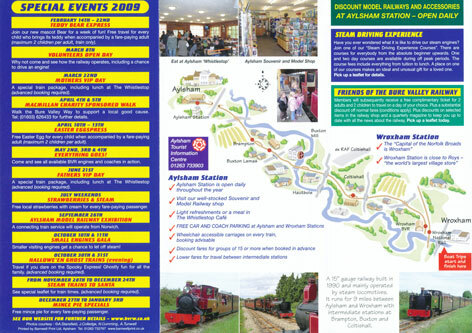 Buxton Lammas, as it was then known, closed for goods in 1964, and Aylsham and Coltishall in 1974. 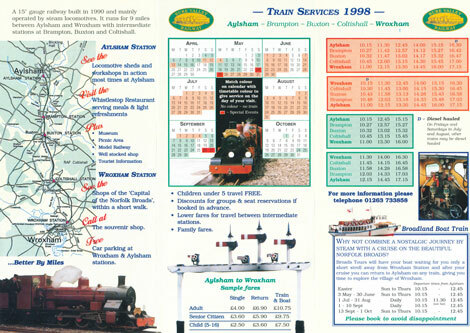 Through freight trains continued to run over the line until 1981 and the line through Aylsham formally closed on 6 January 1982. Track-lifting began the following year. 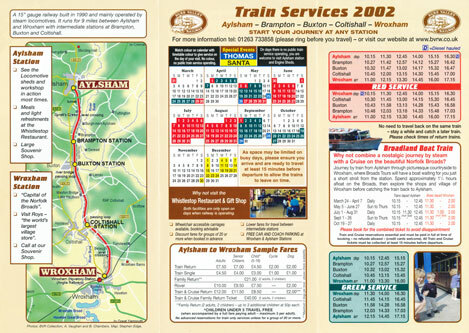 Broadland District Council (BDC) and Norfolk County Council (NCC) bought the trackbed from Hellesdon to Attlebridge and converted it into a footpath and BDC wanted to purchase the Wroxham-Aylsham section to extend the footpath network. It was decided to build a 15inch gauge railway alongside the footpath, receipts from the railway paying for the footpath. 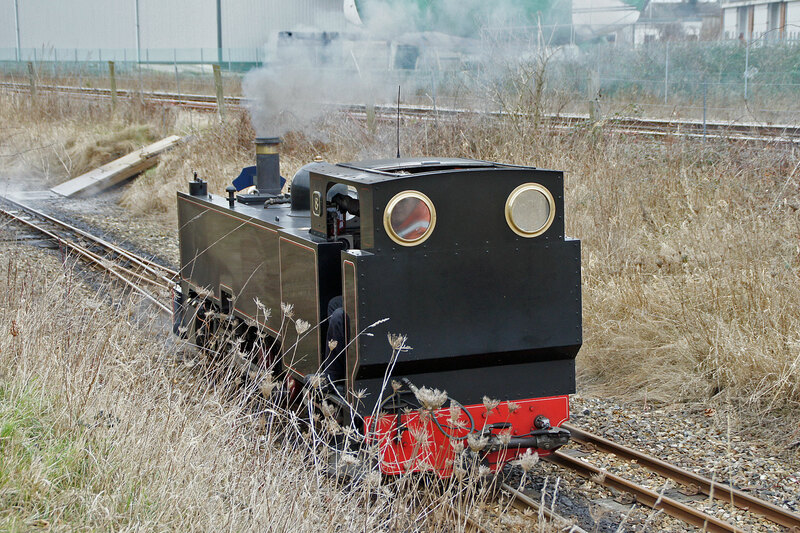 BDC entered into partnership with R.Hudson and J.Edwards who had experience of 2ft and 7.25in gauge railways at the Pleasurewood Hills theme Park in Great Yarmouth. 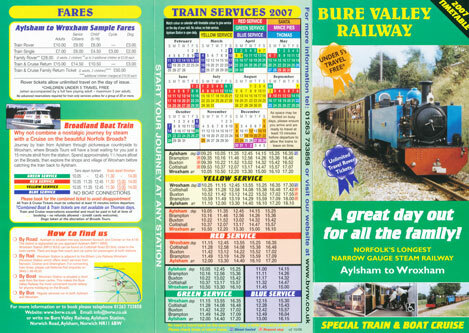 The Bure Valley Railway Ltd was formed with Hudson, Edwards and other directors. 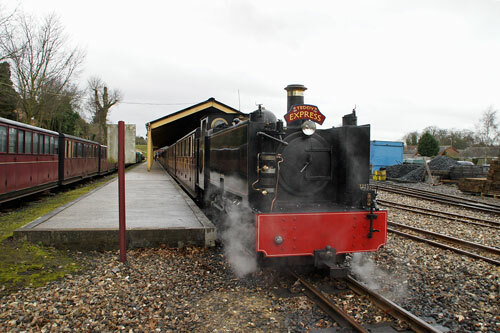 The route was cleared and bridges repaired. 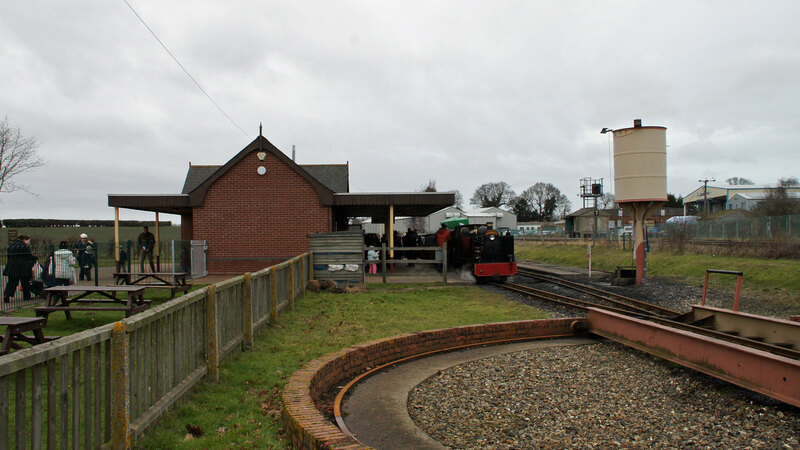 Half of the the original trackbed became the new railway, with the other half laid out as a footpath. 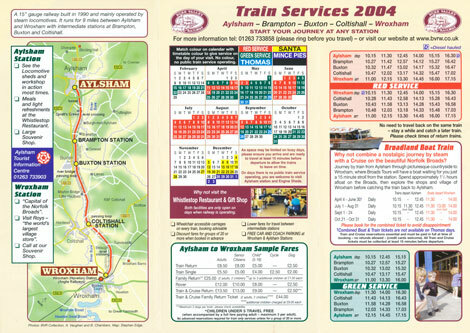 Stations were built at Wroxham (actually in Hoveton) and Aylsham with halts at Brampton, Buxton and Coltishall. 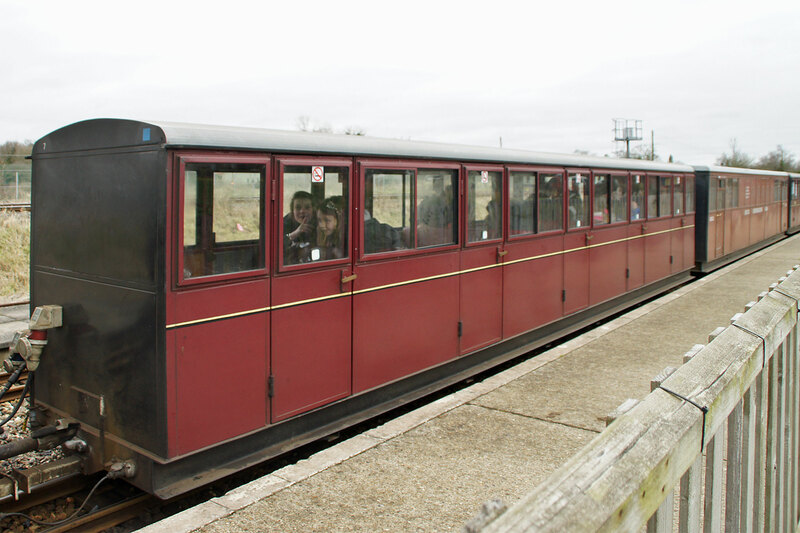 Passing loops were created at Brampton, Hautbois and Coltishall. 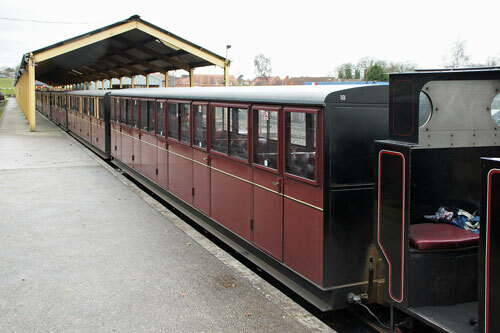 Aylsham station was given an overall roof to protect the rolling stock. 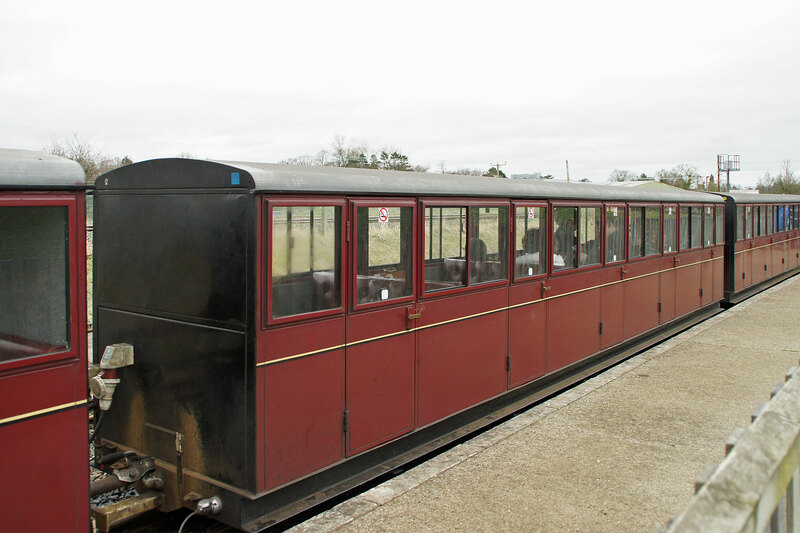 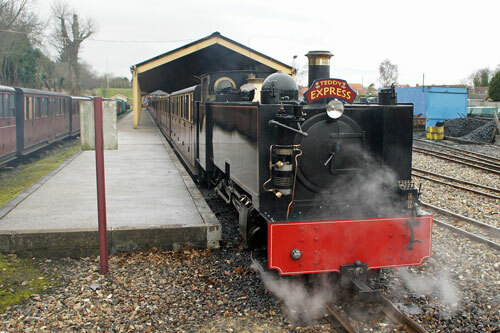 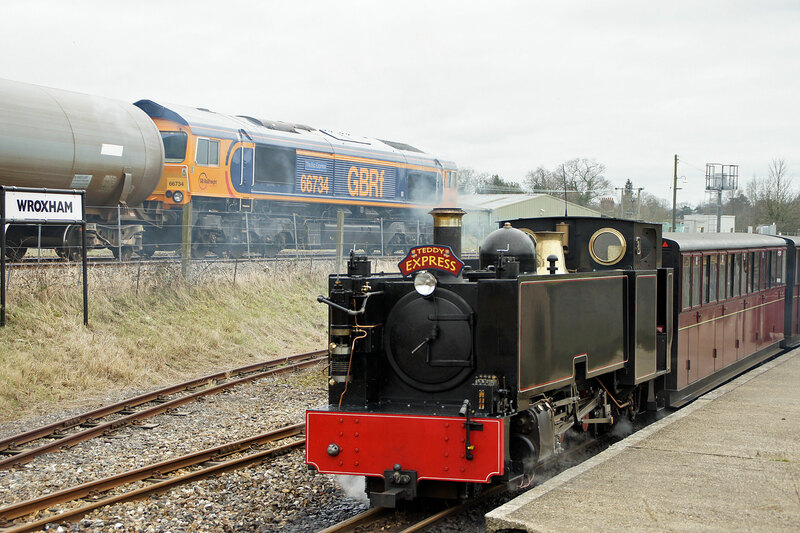 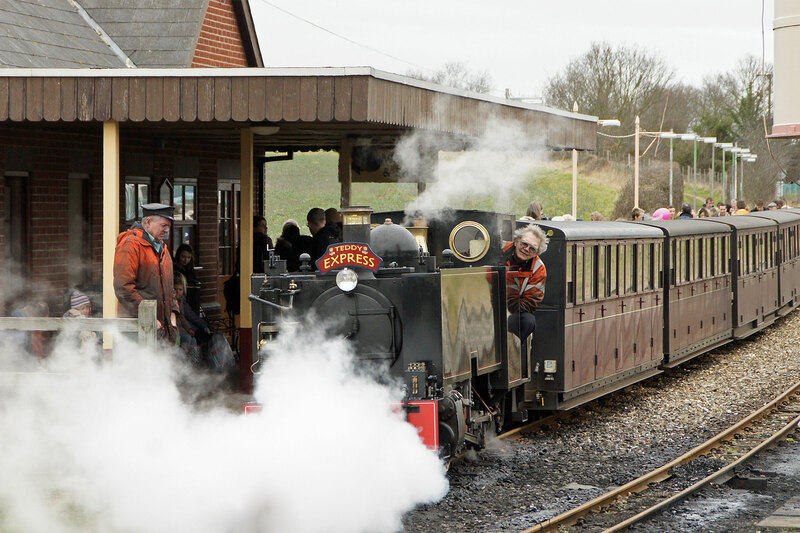 The inaugural train was pulled by Winston Churchill and Samson loaned from the Romney, Hythe & Dymchurch Railway (RH&DR), although they could not maintain brake pressure and the diesel was called out to rescue the train. 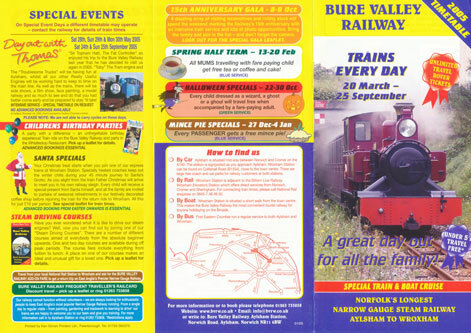 However, the original Bure Valley Railway Company was closed down in January 1991 following the bankruptcy of its parent company. 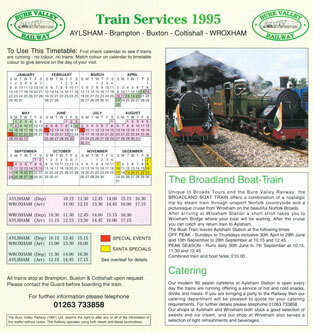 BDC found a new lessee, Mike Hart, and services resumed in April 1991, again using RH&DR stock. 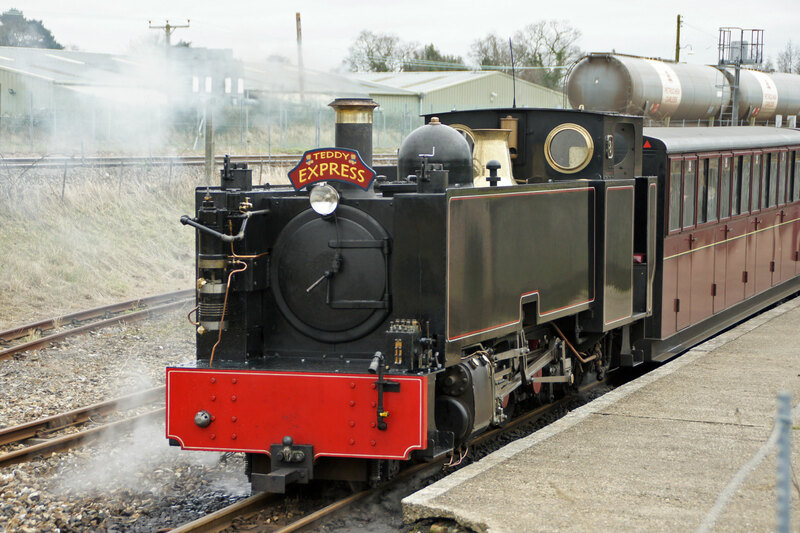 A varied selection of locos were acquired, including an American outline 2-4-2 named Sydney, which had been built as Siân for the Fairbourne Railway. Sandy River No.24 was another American outline loco with 2-6-2 wheel arrangement, which was built in 1990. These locos needed to double-head heavy trains and a more powerful solution was required. In 1993, Robert Baker took over the main shareholding and purchased a new loco No.6 Blickling Hall from Winson Engineering. 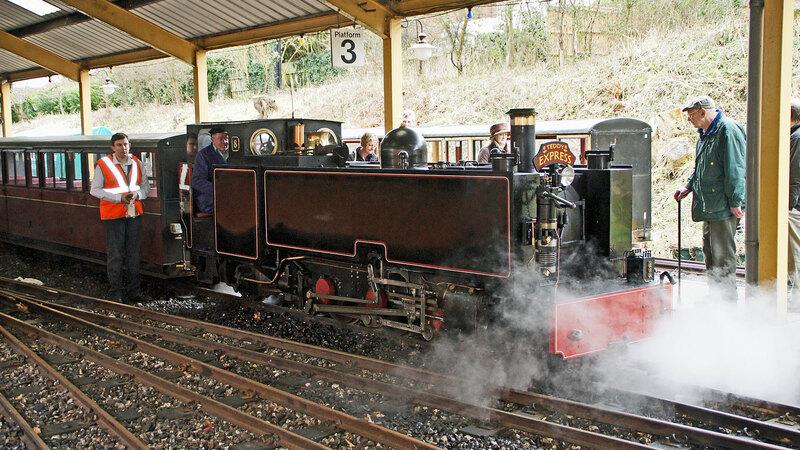 This was a half-scale version of the ZB 2ft 6in gauge 2-6-2 locos on Indian Railways. 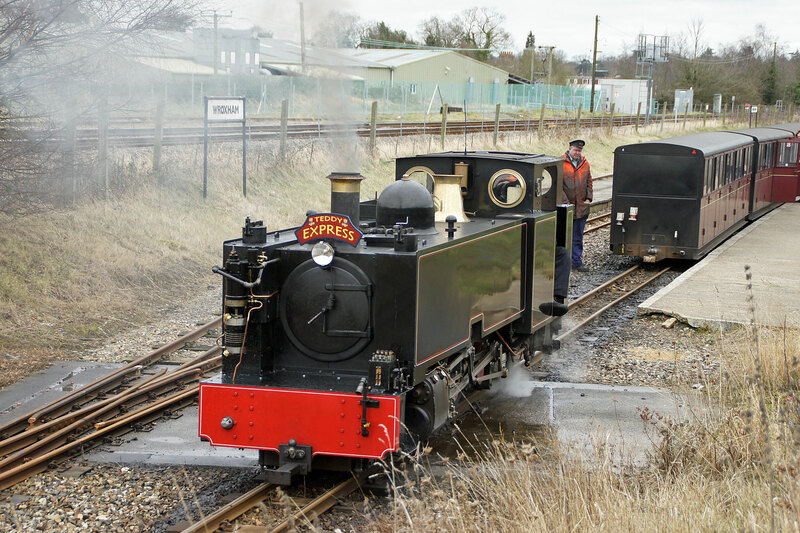 She was joined in 1994 by sister loco No.7 Spitfire. 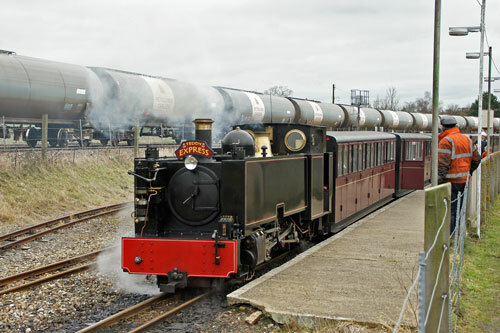 These were powerful enough to pull the heaviest trains single-handed. 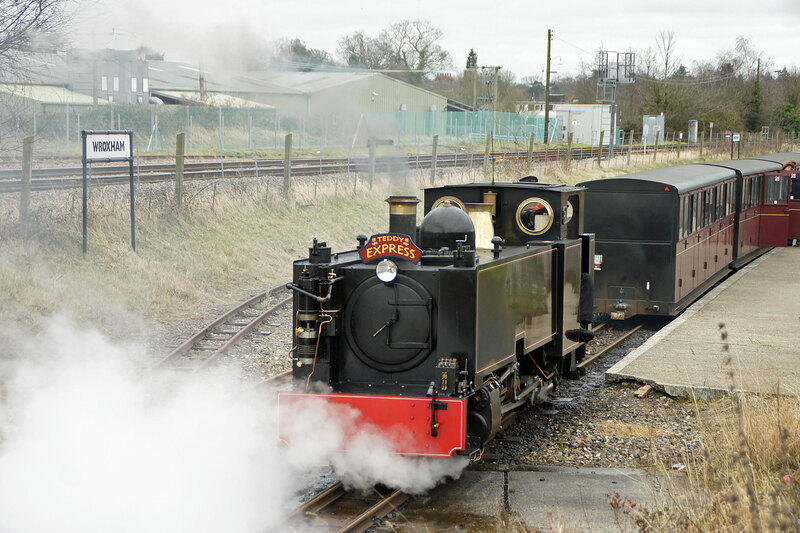 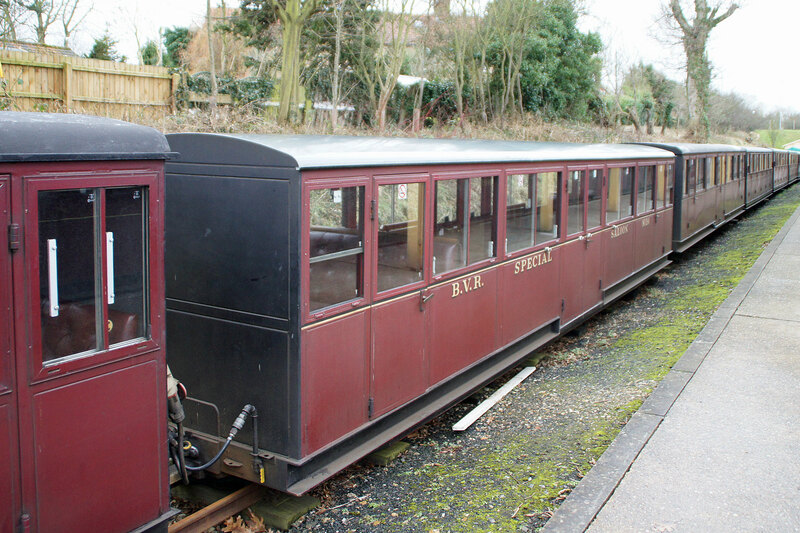 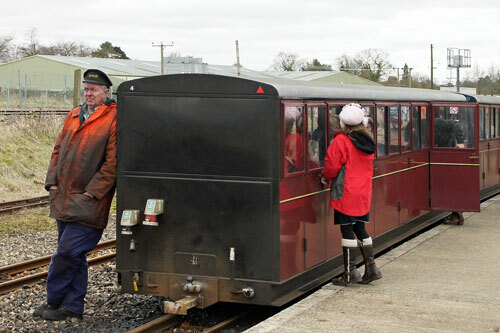 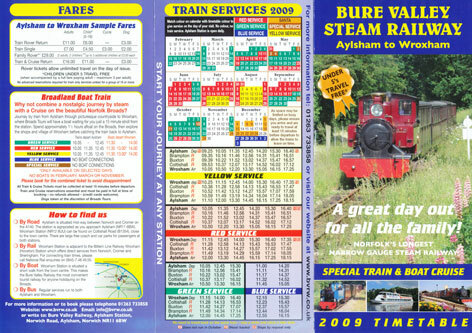 Ownership changed again in 1995 when shares were bought by a group of enthusiasts who formed Westernassets Ltd and drastically reduced the costs of the operation with greater volunteer use through the Friends of the Bure Valley Railway. 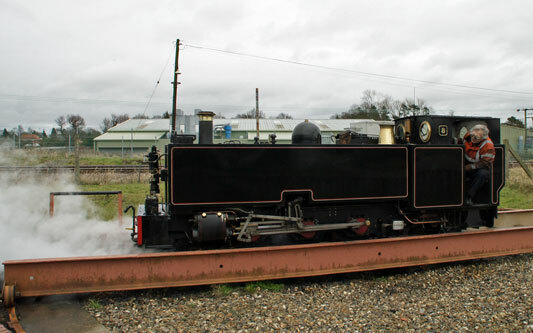 Two further ZB locos were built using the standard chassis and boiler but with tank locomotive outlines based on Vale of Rheidol and Leek and Manifold prototypes. They were originally oil burners but later converted to coal. 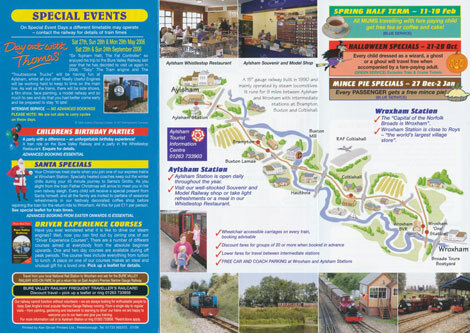 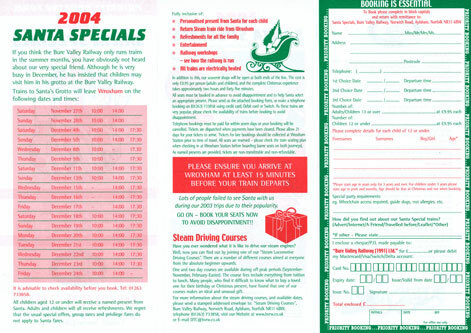 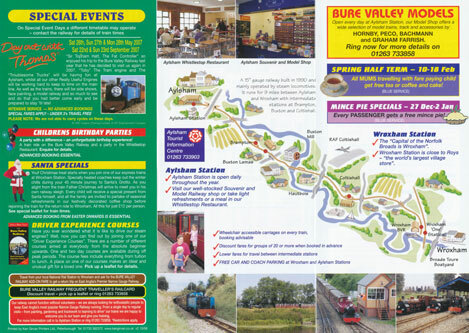 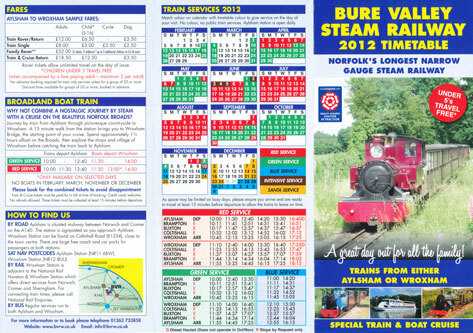 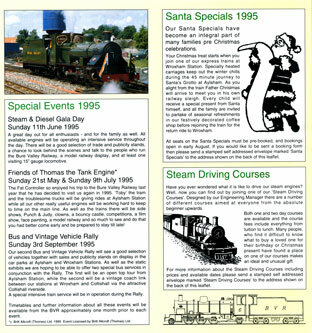 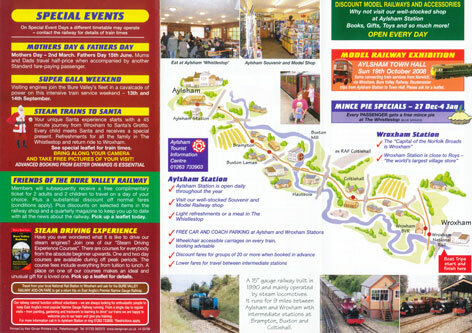 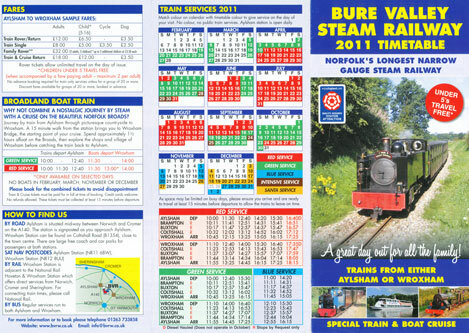 Bure Valley Railway (BVR) - this page! 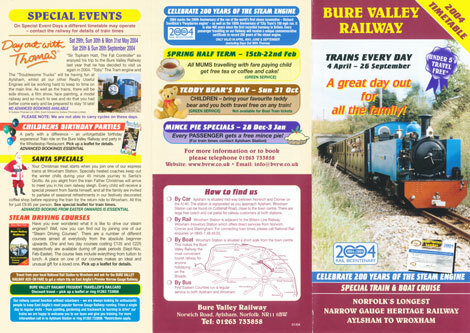 The Bure Valley Railway was opened on 10th July 1990 along the trackbed of the the East Norfolk Railway's branch from Wroxham to Aylsham. 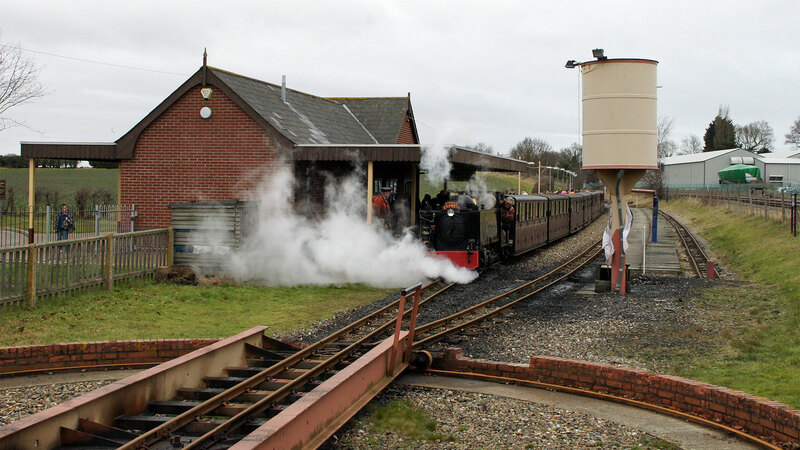 Initial BVR trains were operated by locos on loan from the Romney, Hythe & Dymchurch Railway (RH&DR), initially Winston Churchill and Samson. 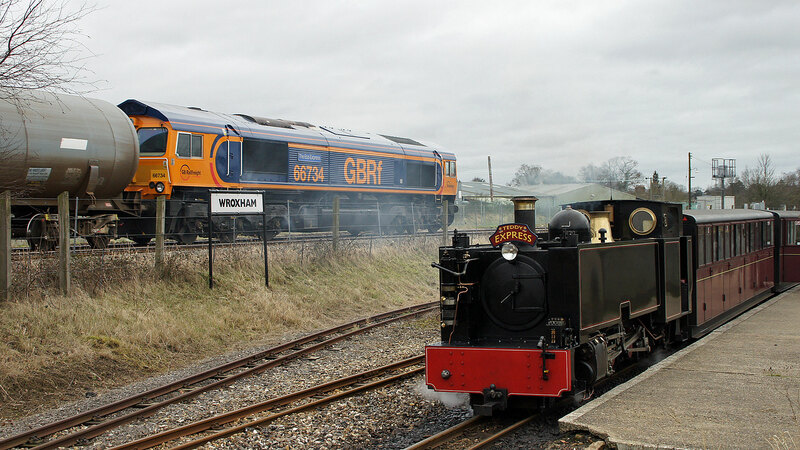 Every loco in the RH&DR fleet has subsequently visited the BVR. 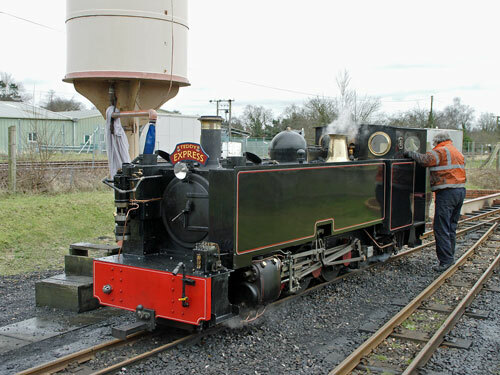 A varied selection of locos were acquired, including an American outline 2-4-2 named Sydney, which had been built as Siân for the Fairbourne Railway. 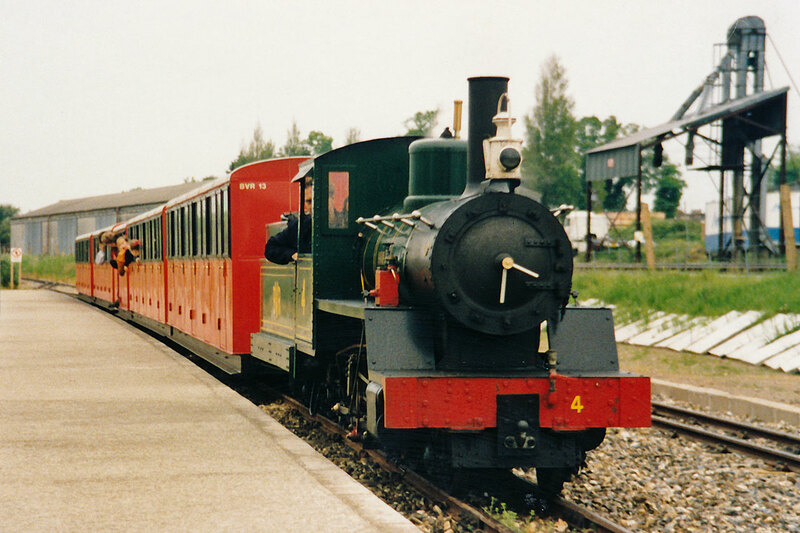 Sandy River No.24 was another American outline loco with 2-6-2 wheel arrangement, which was built in 1990. 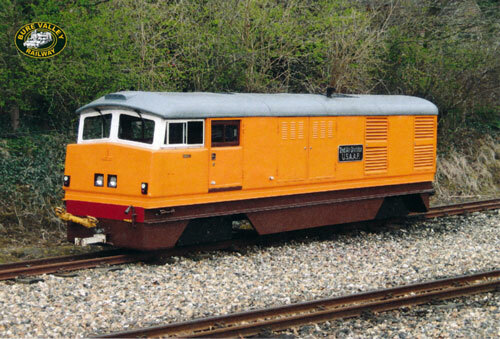 These locos needed to double-head heavy trains and a more powerful solution was required. 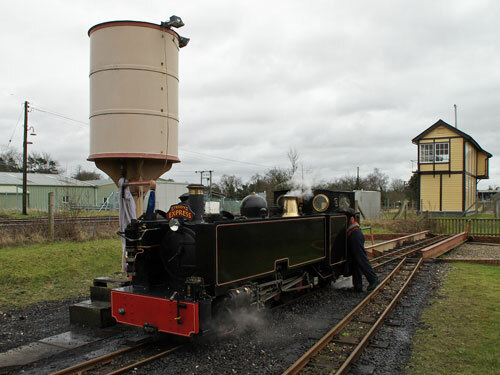 n 1993, Robert Baker took over the main shareholding of the BVR and purchased a new loco No.6 Blickling Hall from Winson Engineering. This was a half-scale version of the ZB 2ft 6in gauge 2-6-2 locos on Indian Railways. 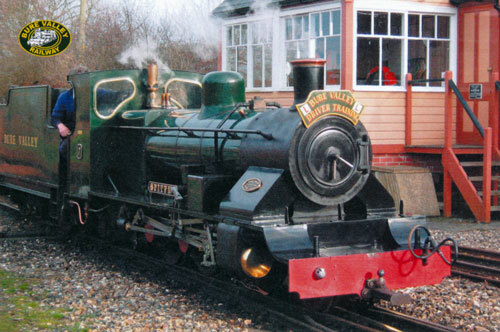 She was joined in 1994 by sister loco No.7 Spitfire. 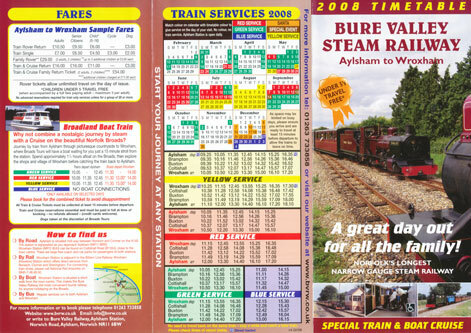 These were powerful enough to pull the heaviest trains single-handed. 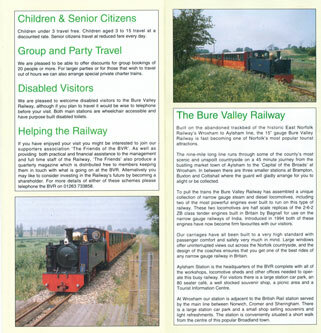 Ownership changed again in 1995 when shares were bought by a group of enthusiasts who formed Westernassets Ltd and drastically reduced the costs of the operation with greater volunteer use through the Friends of the Bure Valley Railway. Two further ZB locos were built using the standard chassis and boiler but with tank locomotive outlines based on Vale of Rheidol and Leek and Manifold prototypes. The two ZB tank locos were originally oil burners but later converted to coal. 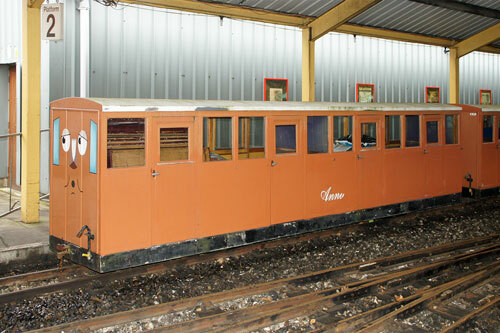 Siân was built in 1963 for the Fairbourne Railway in Wales. She was named after the 15 year old daughter of the railway's solicitor, who was a close friend of the railway owner. 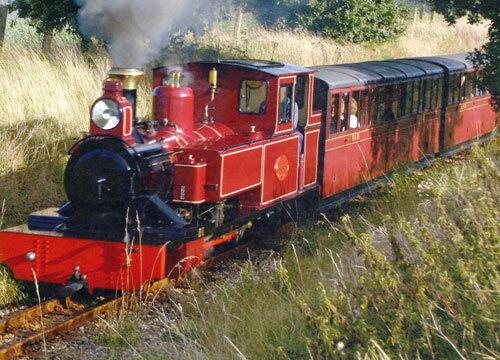 The design was almost the same as a loco called Katie which ran on the railway at Dudley Zoo. They had both been designed in 1951 by Ernest Twining (who used to work for the model engineer Bassett-Lowke). 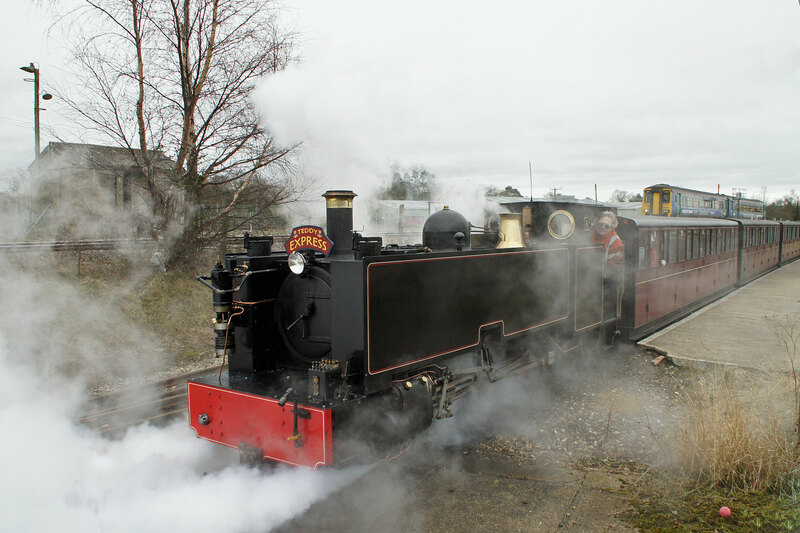 Both engines were built by Trevor Guest Engineering Co. of Stourbridge, who made other locomotives for the Fairbourne Railway. Both locos were painted Mid green with indian red frames, although shades varied from year to year. Katie was also bought by the Fairbourne Railway in 1965 and both locos were the main motive power on the line until 1984. Under new ownership in 1984, Katie was sold to Haigh Hall near Wigan. Siân was heavily rebuilt into an American outline steam engine called Sydney for the 1985 season. 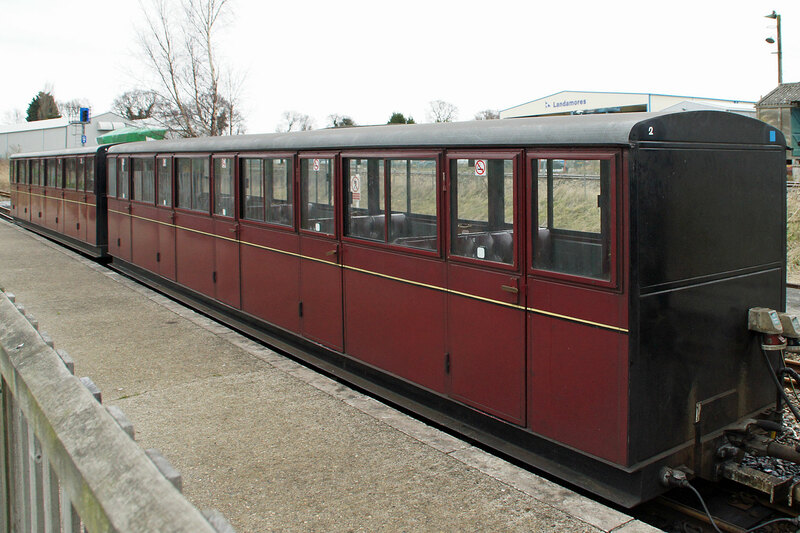 It was then sold to Littlecote Park in Hungerford, Wiltshire. 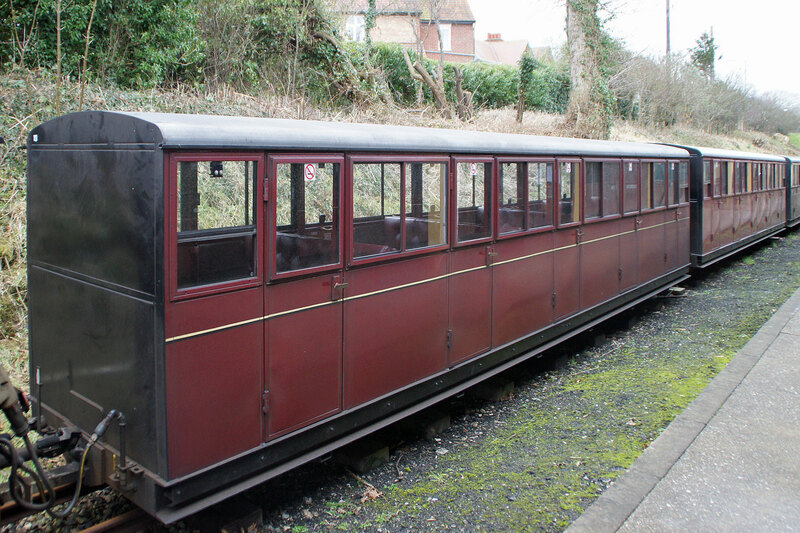 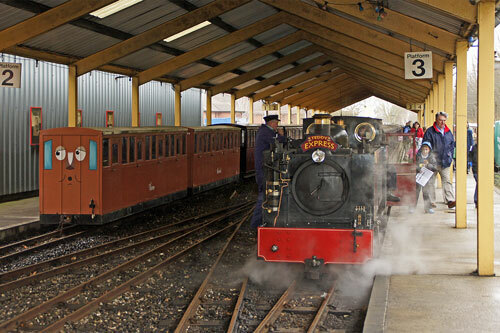 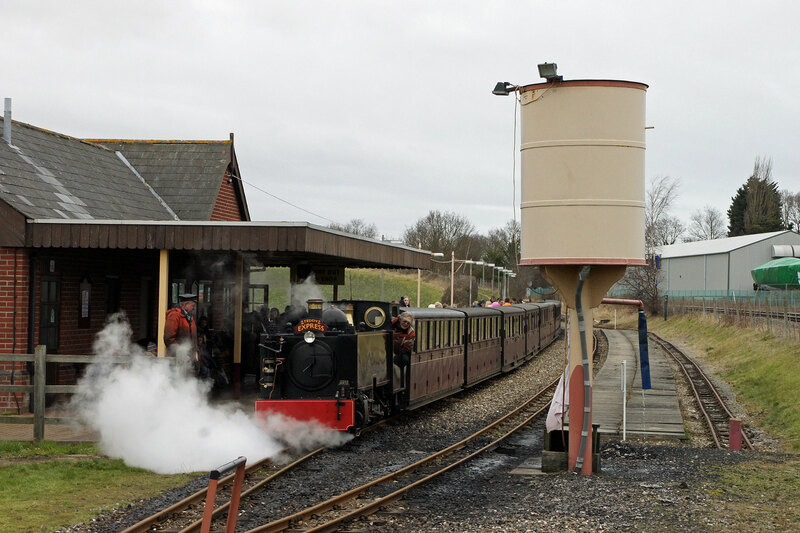 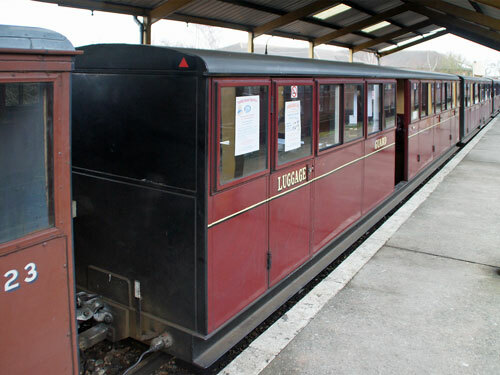 The Fairbourne Railway is now a 12 ¼" railway. When the railway at Littlecote closed down in 1990, Sydney was up for sale again. 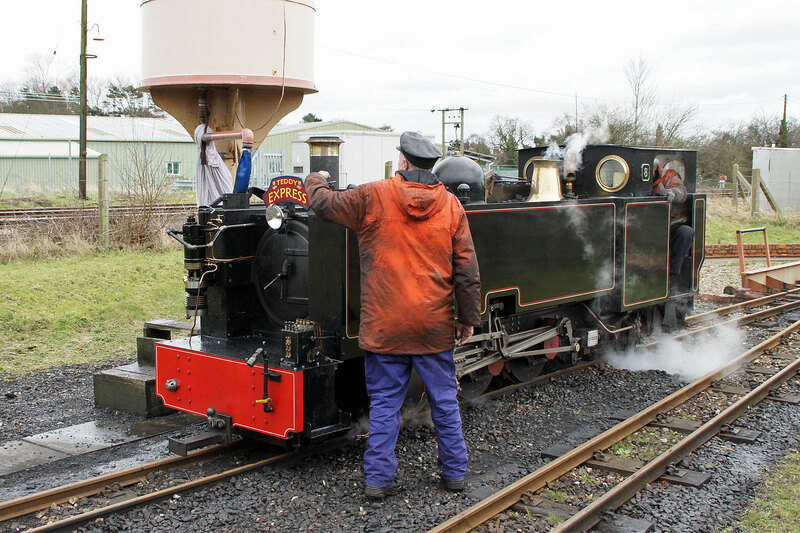 Siân had visited Ravenglass in 1976 when Siân first impressed the Ravenglass crews. A consortium of Ravenglass and Eskdale Railway volunteers formed a group intending to purchase the loco for use at Ravenglass. 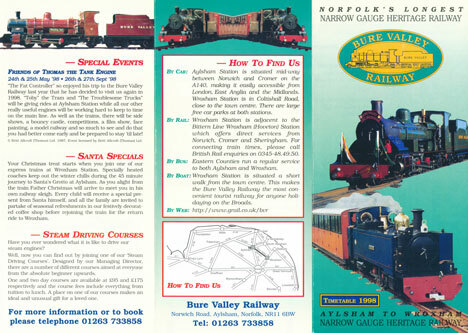 However, the newly built Bure Valley Railway in Norfolk were desperately in need of motive power and outbid the Ravenglass consortium. Whilst at the Bure Valley, Sydney was altered into a more conventional outline and painted maroon. 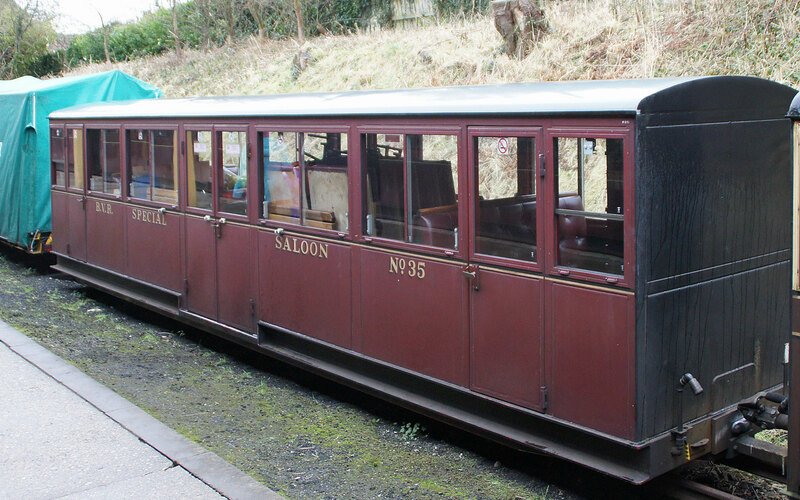 It was renamed Siân again, although it was not to the original design. 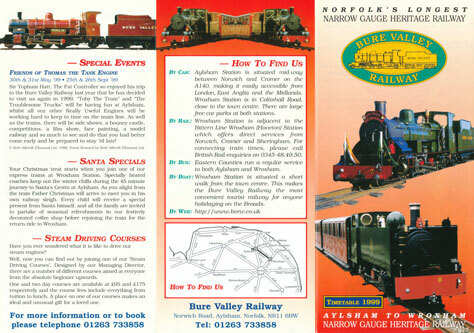 In 1994, the Bure Valley Railway had built their own locomotives and they decided to sell Siân. 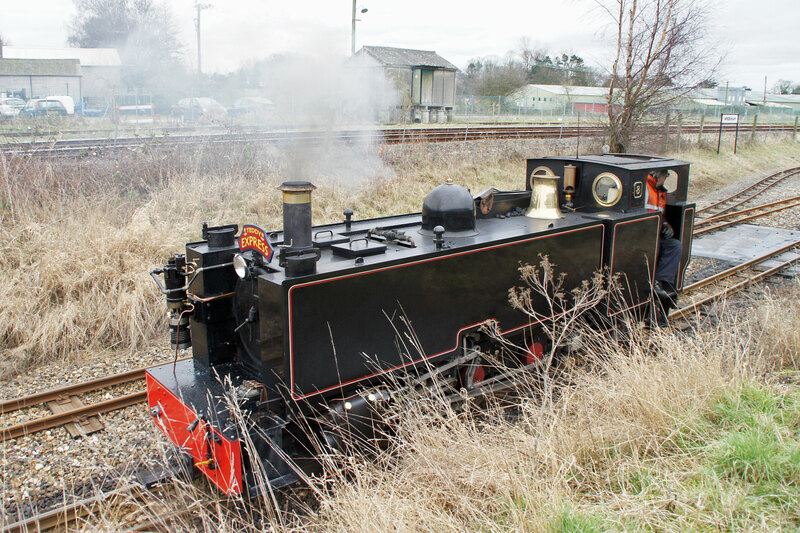 The Ravenglass consortium was already set up for purchasing the loco, and so the sale went through quickly. 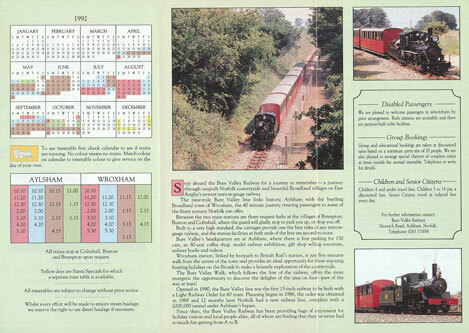 A clause of the sale was that the loco should remain on the BVR for 1994. By this time, Siân had passed through three owners in the space of ten years, none of whom had a long term interest in Siân. 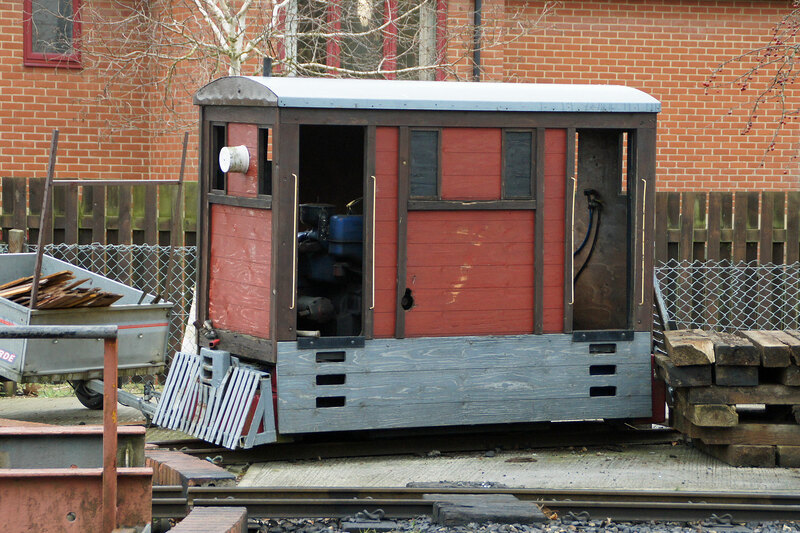 As a result, the loco was worn out and needed a lot of mechanical work as well as cosmetic improvements. The loco was still serviceable, so in 1995 and 1996, Siân was hired to the Cleethorpes Coast Light Railway. Earning money in the summer season, the overhauls would take place in the winter months, using all the money earned plus extra from group members pockets. It was a difficult time, as no sooner had one repair been effected, then something else would break. By April 1997, the locomotive was now beginning to resemble the Siân that originally appeared in 1963. 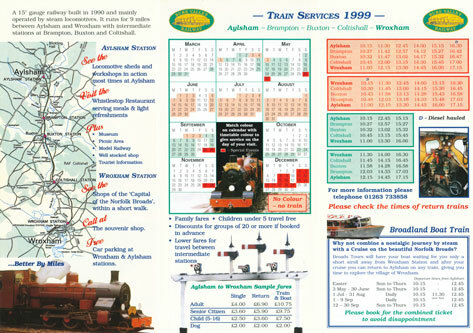 1997 was also spent at Cleethorpes, however no agreement could be made for the 1998 season. 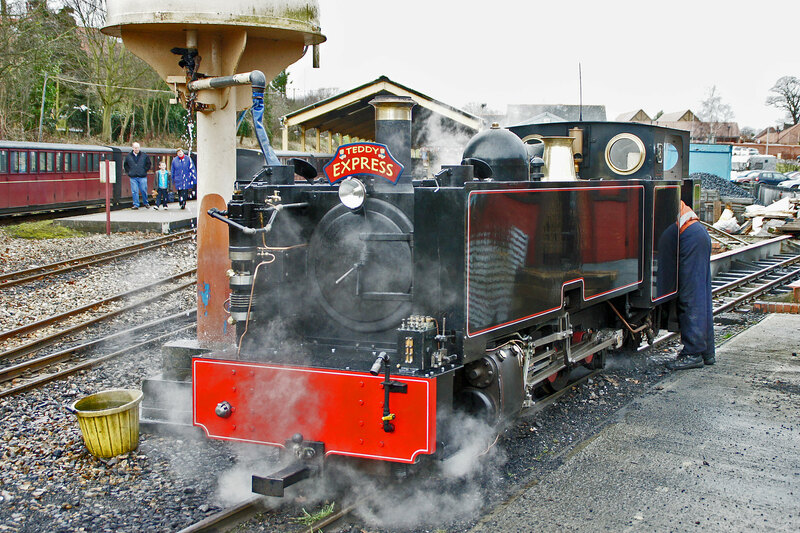 Siân had to find a new home. 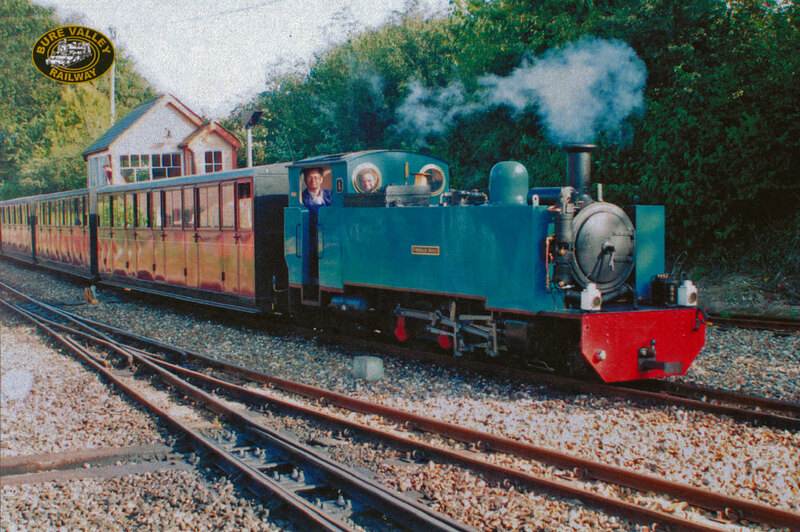 In May 1998, Siân was delivered to the Kirklees Light Railway, near Huddersfield, for the 'Friends of Thomas' weekends in June and July. 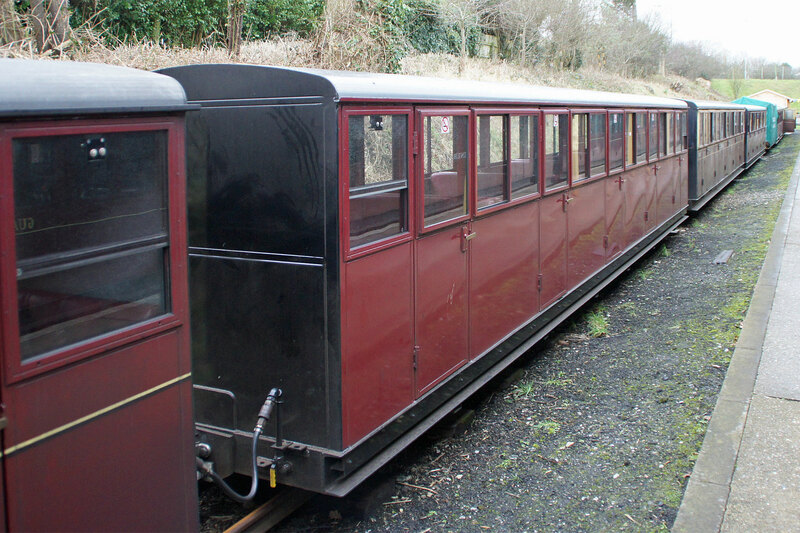 This railway was ideal for this design of loco, where 5 coach trains were easily hauled along the 4 mile line. 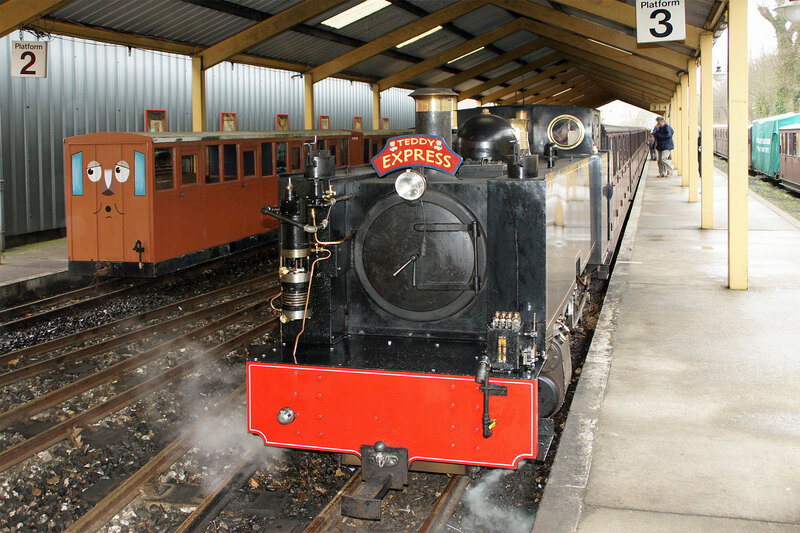 Unfortunately, the boiler developed badly leaking tubes, and failed on the 26th of July. An inspection revealed that further work was required to bring the boiler into a satisfactory condition, including a new front tubeplate. 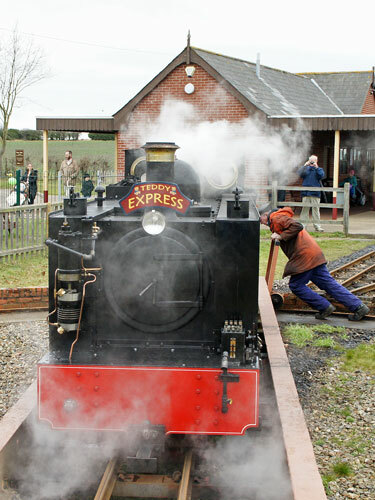 The boiler would have had to be removed in November that year in any case, when its seven yearly insurance certificate expired. It was decided to start the major overhaul straight away, so the loco was taken back to the group headquarters in Ravenglass. 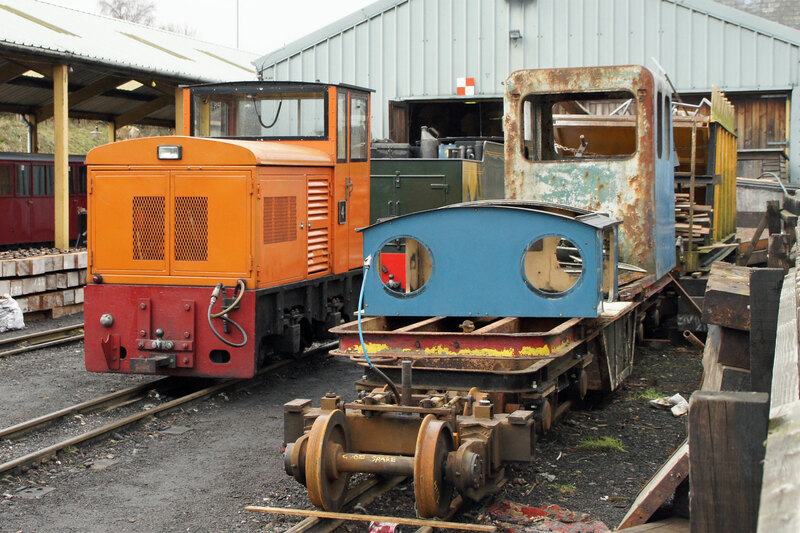 With an 18 month period to do the overhaul, no stone was left unturned. 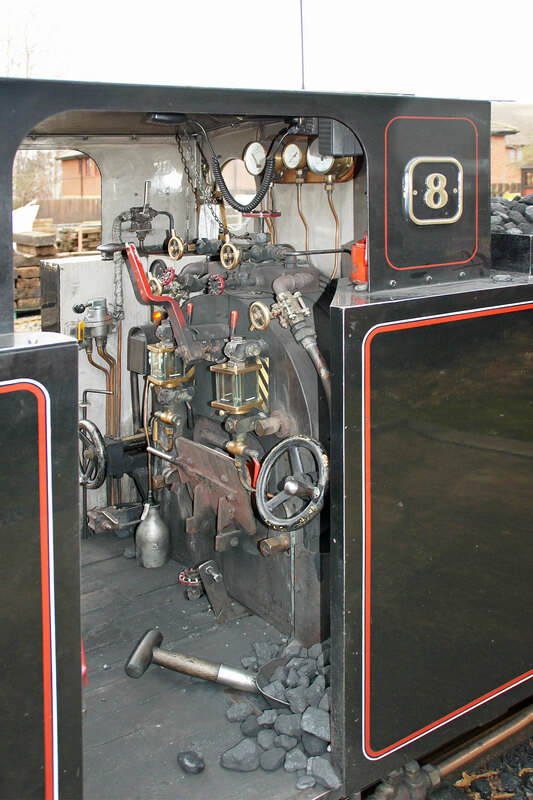 The boiler was stripped down and new tubeplates made for both ends. The chassis was completely overhauled, with new bearings, pins and bushes. 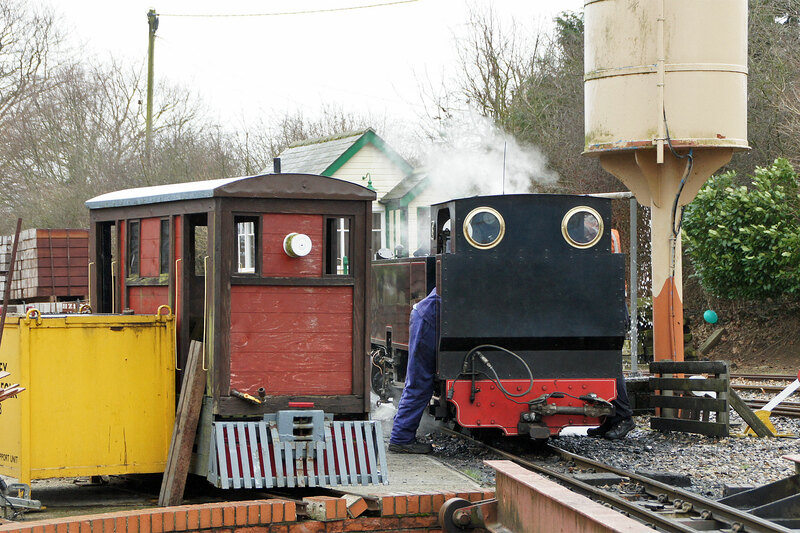 Some astonishing faults were found, such as the driving axle quartering was nearly 3° out on the rear axle and the left hand valve gear was only travelling 75% the distance of the right hand side! 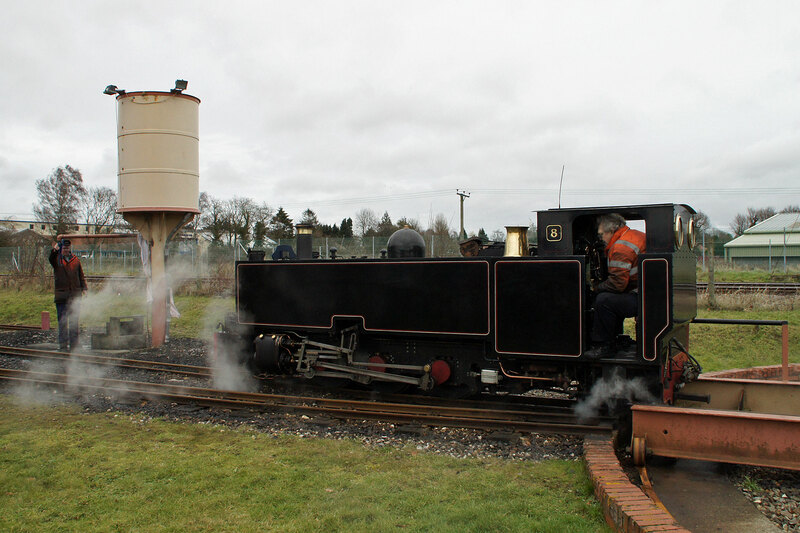 The locomotive was originally ordered from Guest Engineering & Maintenance (Ltd) in 1964 for Captain Hewitt who then owned Katie. sister engine to Siân. The new loco was to be a larger 2-6-2 version of Katie/Siân and the intention was to use both engines on a sugar plantation in the Bahamas. 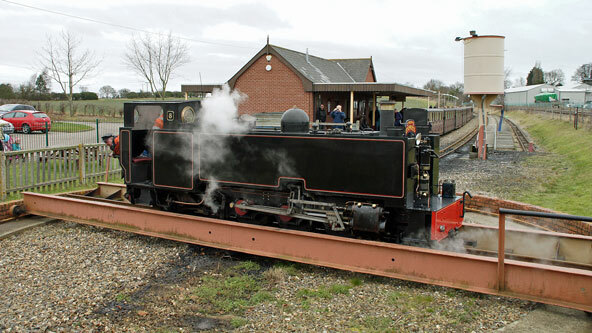 This fell through, followed soon afterwards by the death of Captain Hewitt The order was cancelled after construction had begun and the locomotive was subsequently completed as a steam-outline petrol-hydraulic and was named Tracey-Jo, after the daughter of Trevor Guest. Since originally intended to be steam, she retained the full valve gear etc that had already been manufactured. 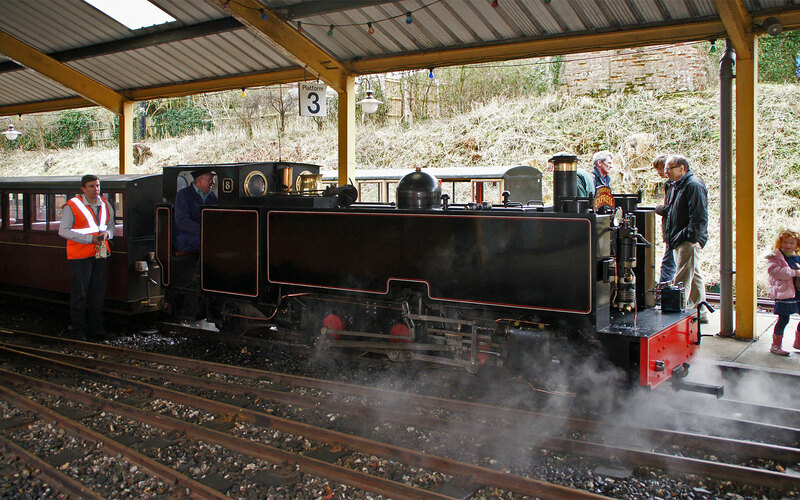 Since then the locomotive has been to numerous locations, including, Fairbourne Railway (1964), Dudley Zoo Railway (1967), RH&DR (1970), Blenheim Palace Railway (1981), Lightwater Valley Railway (1982), Steamtown (Carnforth, 1983) and the Kirklees Light Railway (1990). 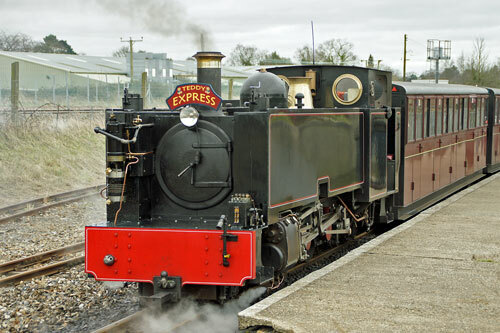 In 1991 Tracey Jo was purchased by the Bure Valley Railway and in 1992 it was rebuilt as a 2-6-4T steam locomotive by Winson Engineering. Upon completion it was re-named Wroxham Broad. 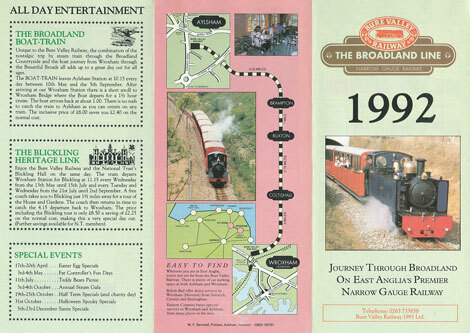 In May 1999 an enthusiastic group of individuals began to purchase Wroxham Broad from the railway and in April 2008 the sale was completed. The locomotive is now owned by 'The No.1 Preservation Group' and is on long term loan to the Bure Valley Railway. 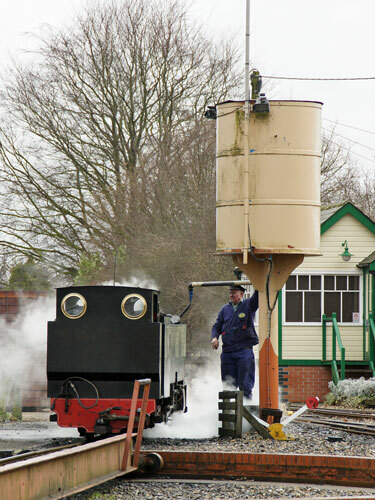 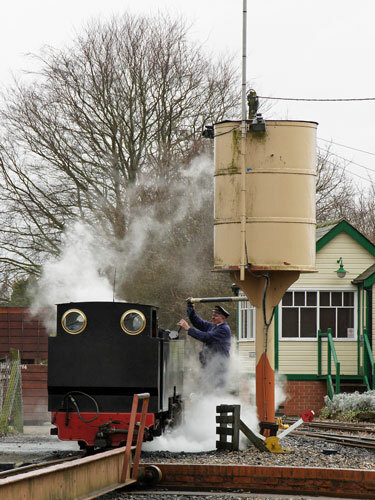 No.3 is a Bo-Bo diesel hydraulic powered by a Bedford engine, designed and constructed by John Edwards of Great Yarmouth. 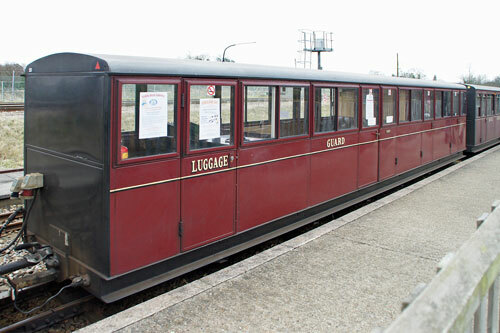 Named 2nd Air Division USAAF in 1998 following a major overhaul. 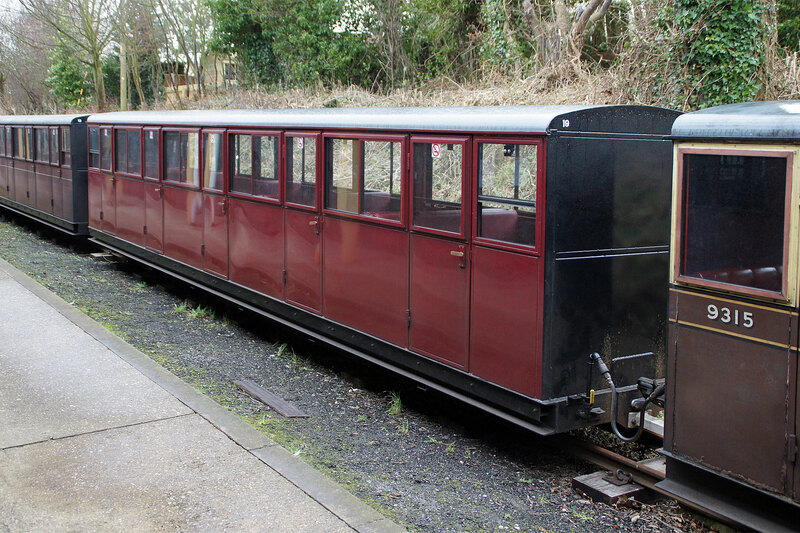 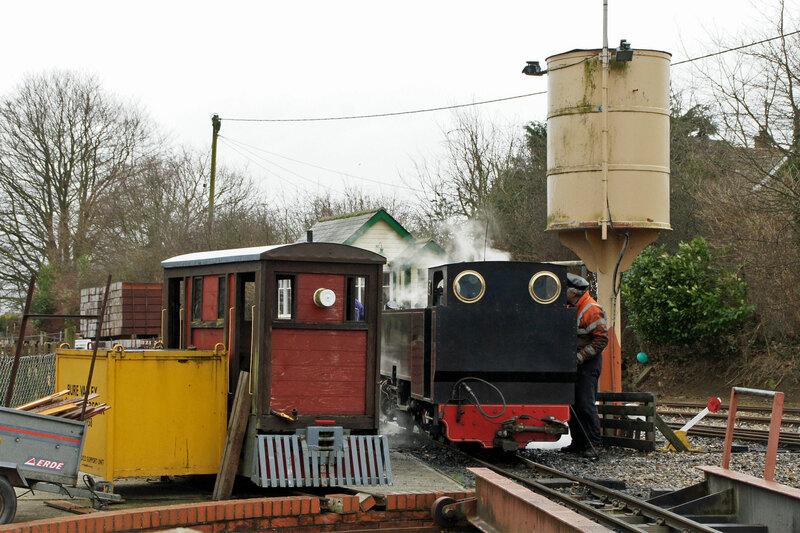 No.4 is a Hudson-Hunslet industrial diesel originally fitted with a 21hp Ailsa engine. 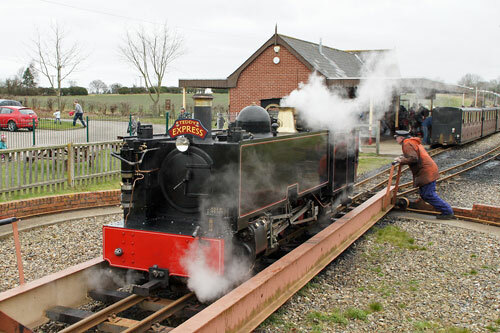 She was purchased by the Friends of the Bure Valley Railway in 1993 and rebuilt with a Peugeot diesel engine and hydraulic drive. 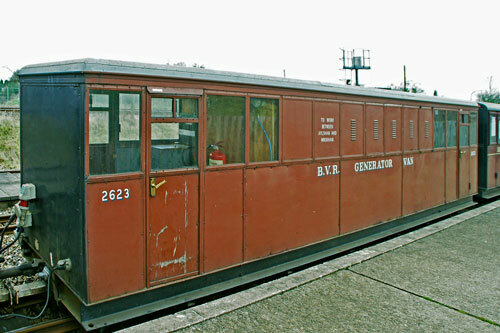 it is unofficially known as Rusty and is used for pilot and PW duties. No.5 is a Lister 0-4-0 industrial diesel mechanical originally used by Fisons on the Somerset Levels. 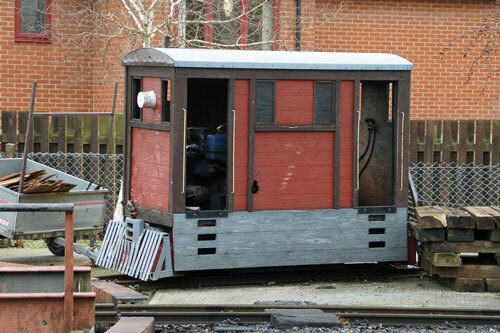 Regauged from 2ft to 15ins, it has been converted to resemble a Wisbech & Upwell Tramway loco, the prototypes for Toby the Tram Engine. 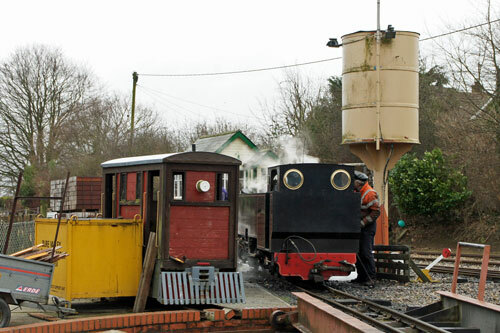 No5 looked rather tired on my February 2012 visit. 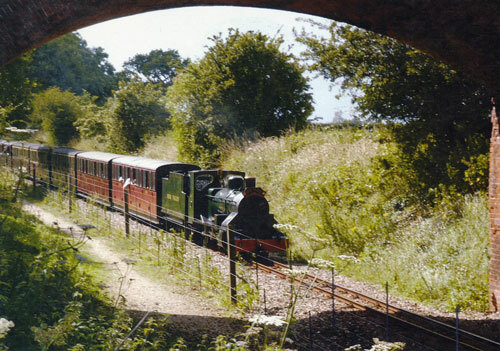 In 1993, Robert Baker took over the main shareholding and purchased a new loco No.6 Blickling Hall from Winson Engineering. 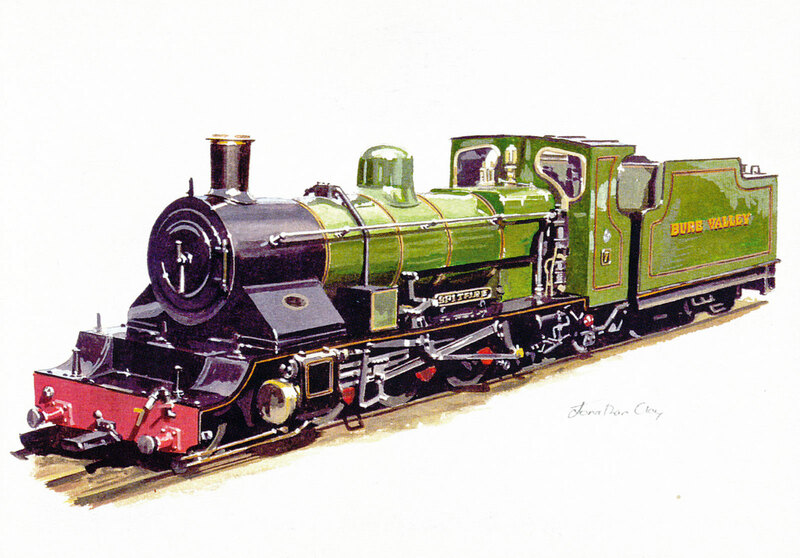 This was a half-scale version of the ZB 2ft 6in gauge 2-6-2 locos on Indian Railways. 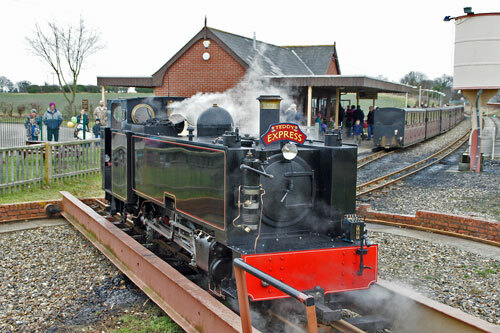 She was joined in 1994 by sister loco No.7 Spitfire. In 1993, Robert Baker took over the main shareholding and purchased a new loco No.6 Blickling Hall from Winson Engineering. 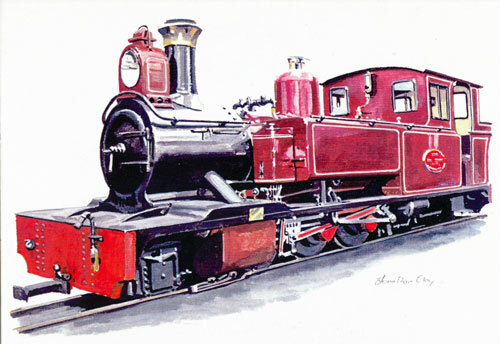 This was a half-scale version of the ZB 2ft 6in gauge 2-6-2 locos on Indian Railways. 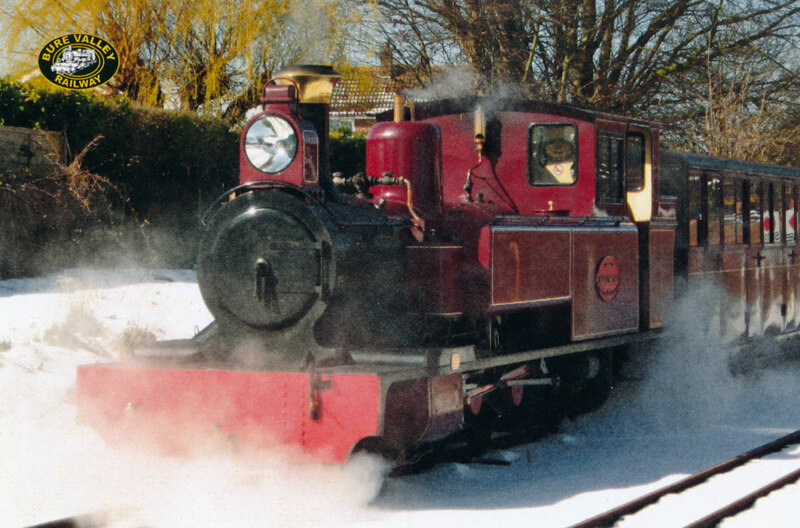 She was joined in 1994 by sister loco No.7 Spitfire. 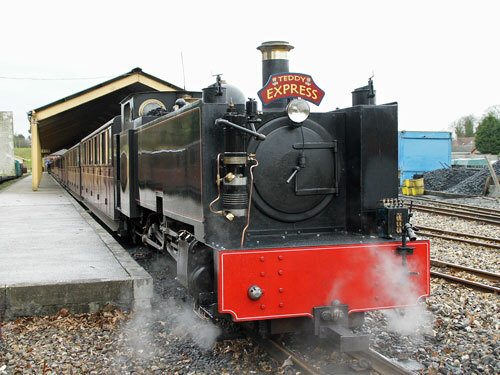 She is privately owned and leased to the BVR. BVR No.8 was the third ZB Class locos supplied to the the railway. 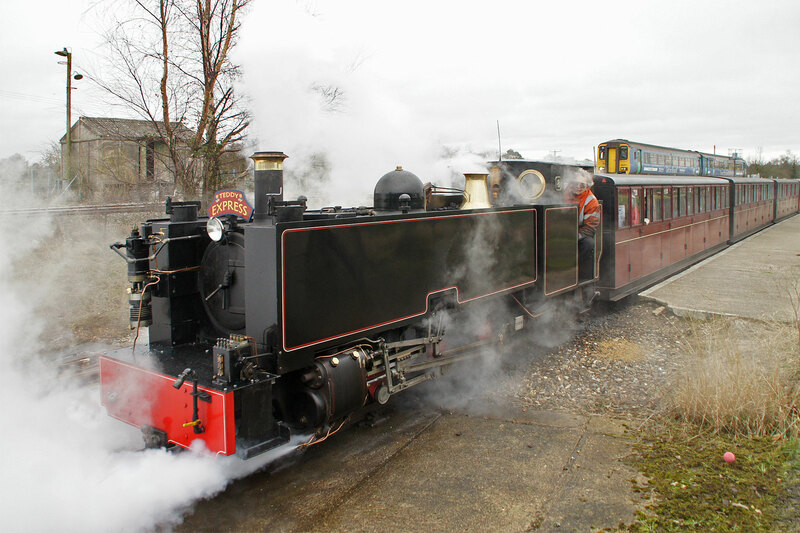 Whereas Nos.6 & 7 looked similar to the original Indian ZBs, No.8 is a 2-6-2T based on the Vale of Rheidol engines. Assembled at Aylsham from components made by Winson Engineering. 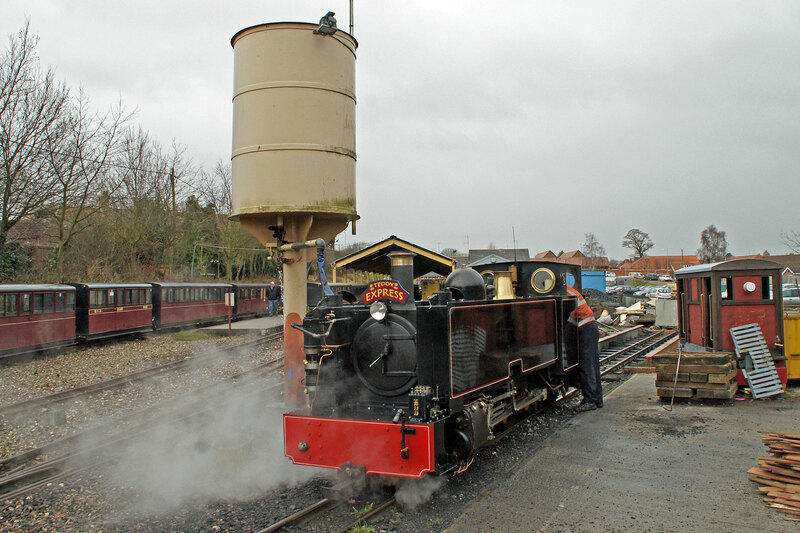 She was originally oil fired and was named Thunder due to the noise this created. However, she was the weakest of the ZBs and clocked up a low annual mileage. Following conversion to coal firing in 2007-8 the performance is much improved and she was used extensively in 2011. It is possible that the name will be changed since it is no longer appropriate. 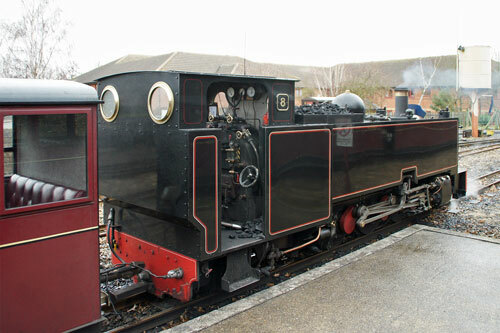 BVR No.9 was the third ZB Class locos supplied to the the railway. 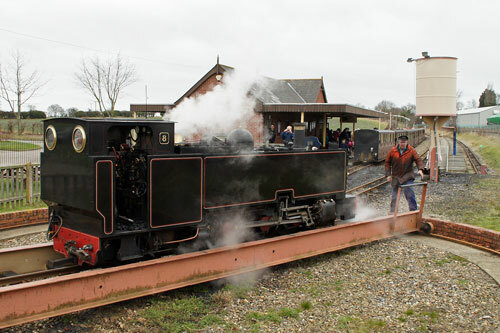 Whereas Nos.6 & 7 looked similar to the original Indian ZBs, No.9 is a 2-6-2T based on the Leek & Manifold engines. Mostly assembled by Winson Engineering and completed by Alan Keef. She is privately owned and leased to the BVR. 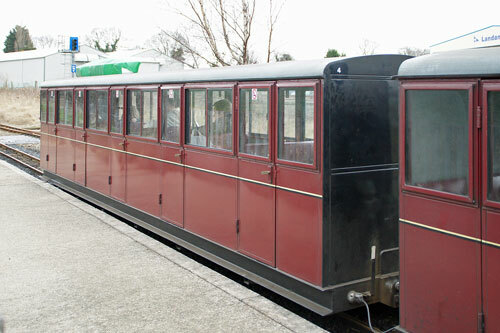 Standard coaches 1-20 were built new in 1989/90. 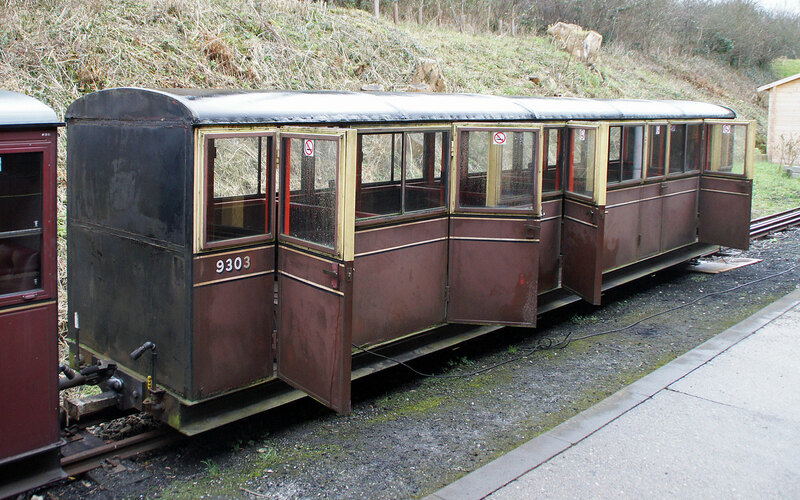 They are fitted with Westinghouse brakes and electric lighting (necessary for the tunnel). 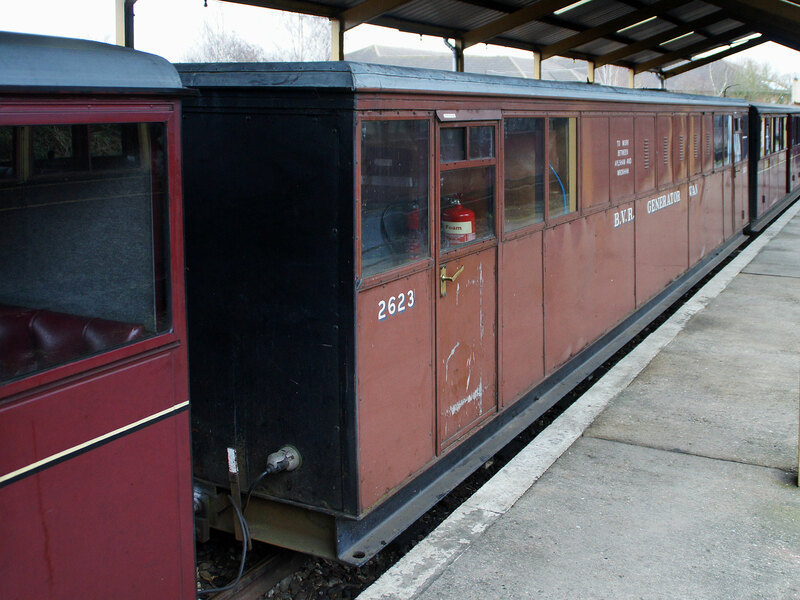 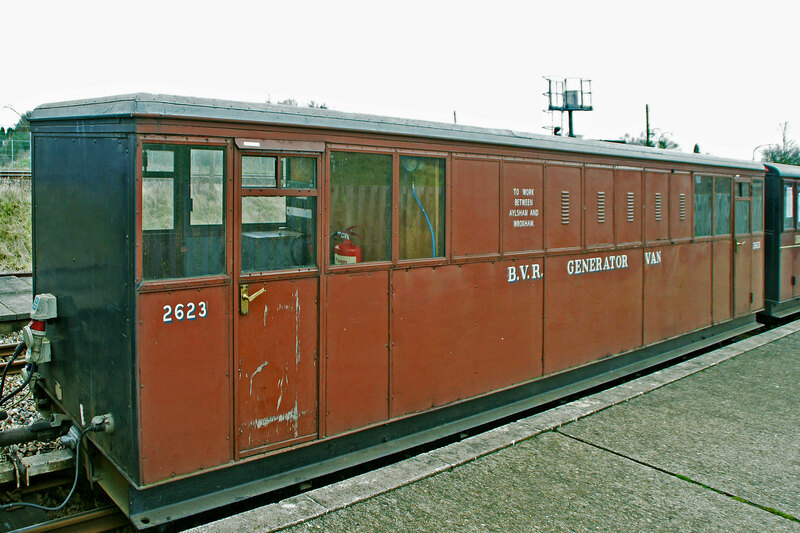 No.20 was later rebuilt as a guard's van. 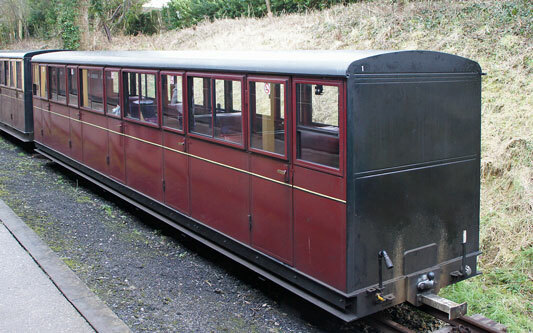 In recent years coaches were formed into maroon and brown & cream rakes. Maroon is now the standard livery and most coaches have been repainted. 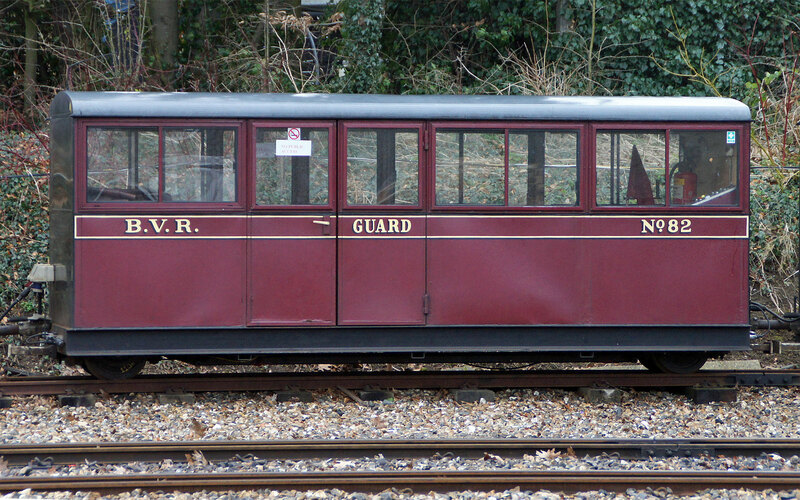 The Guard's Van 20 was the last of the standard coaches 1-20 rebuilt with guard's and luggage areas plus retaining 8 passenger seats. 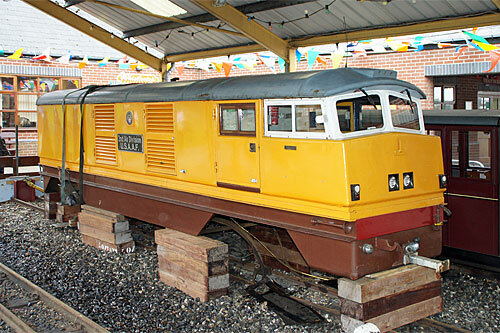 The Generator Van was the prototype coach of the BVR built in 1988. Displaced by the series built standard coaches 1-19 by 1994, it was rebuilt as a generator van to supply heating on winter trains and to provide power for maintenance works. 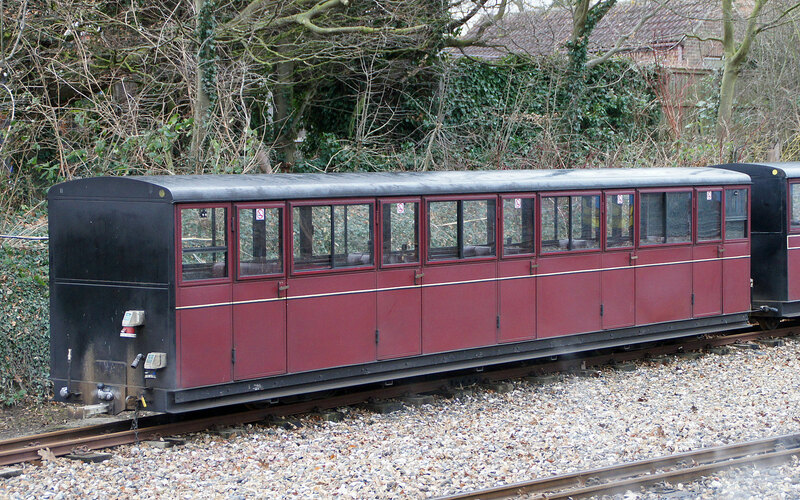 It carries a brown livery. 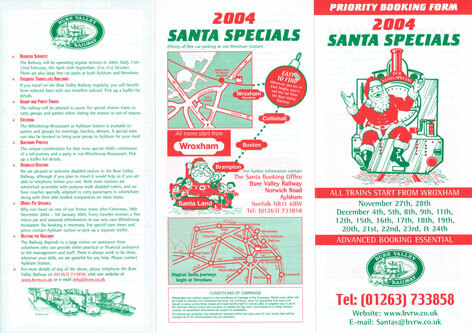 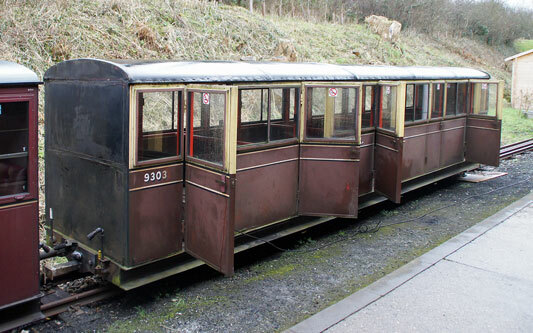 Special saloons 30-35 have a central saloon area fitted with ramps and suitable for wheelchairs, pushchairs etc 30-31 were built in 1998 and 32-25 in 2002. Coach Nos.81-82 are four wheel guard's vans. 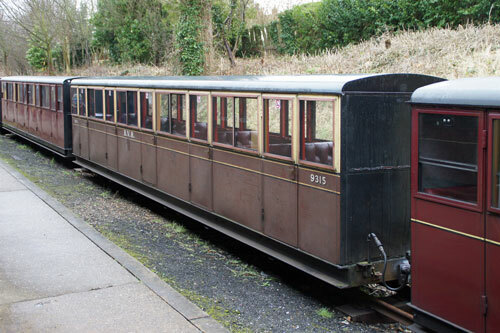 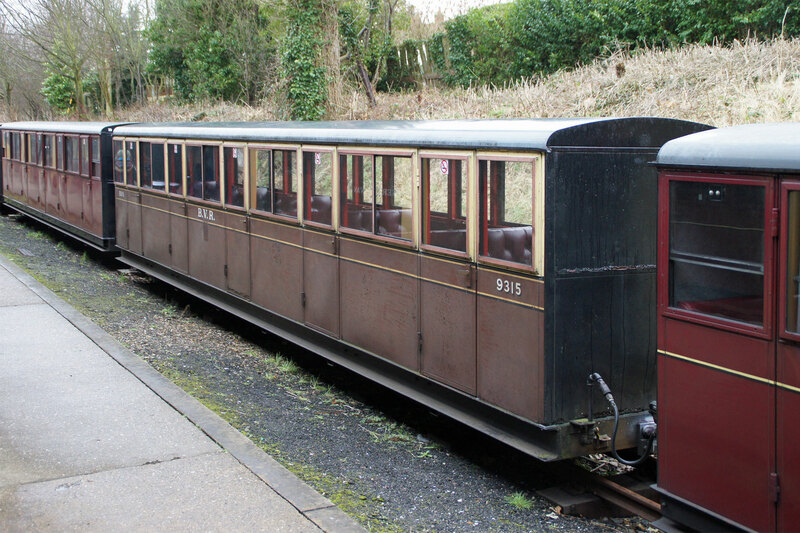 Coach Nos.123 & 125 are ex-Fairbourne Railway. 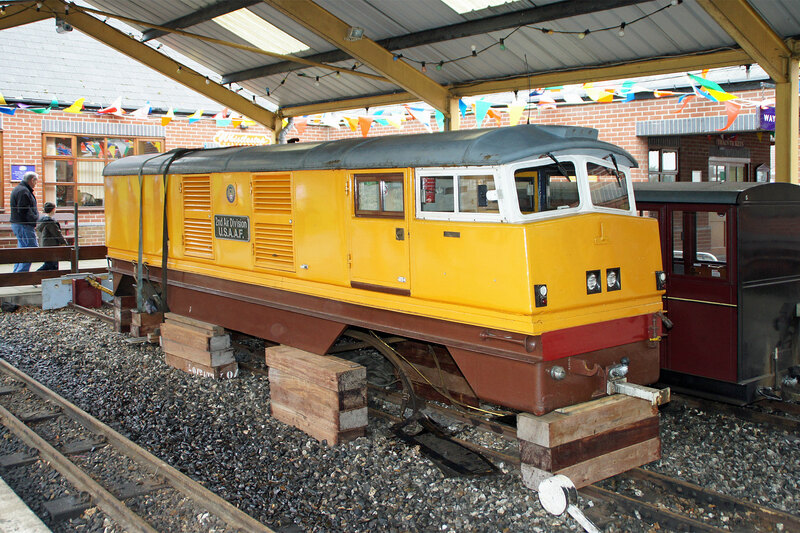 They are privately owned and loaned to the BVR. In 2012 they were in Rev.Awdrey livery as Annie and Clarabel. 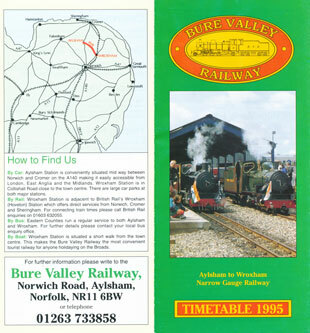 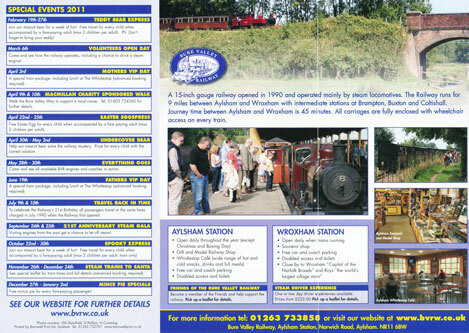 The main station and shed for the BVR is Aylsham. 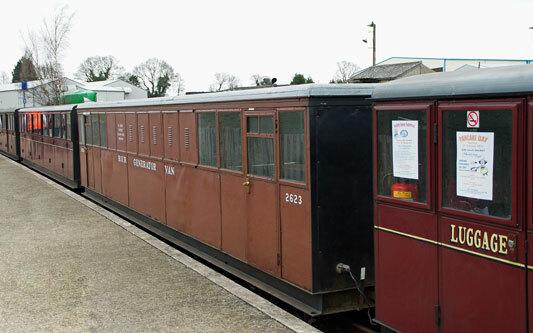 The station has an overall roof which also protects the rolling stock. 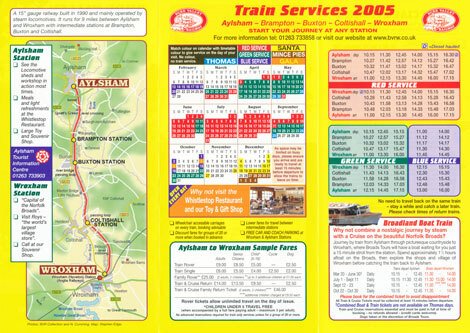 The the other terminus station for the BVR is Wroxham, adjacent to national rail station Hoveton & Wroxham.